The good news is that the process has become much less involved in recent years, which means it'll be a lot easier for you to learn. Once you get the folder set up to where you can start engaging in command line code for ADB and Fastboot, everything else is a breeze — regardless of whether you're using Windows, Mac, or Linux. With this guide, I'll show you how to set up your command window so you can start using the commands on your device right away. Before you can start using ADB and Fastboot commands, you need to grab the "SDK Platform Tools" from Google. It's a zipped folder that includes all of the core basics for getting the commands up and running — all without having to install any fancy development kits or extra software, which makes it dead simple to set up. Follow along with the guide in the link below, and it will show you how to get the command line environment up and running on a Mac, Windows, or Linux machine. Once you get ADB and Fastboot set up and working on your computer, you can move onto the next step of this guide. Now, head to the folder where you extracted the platform-tools ZIP. 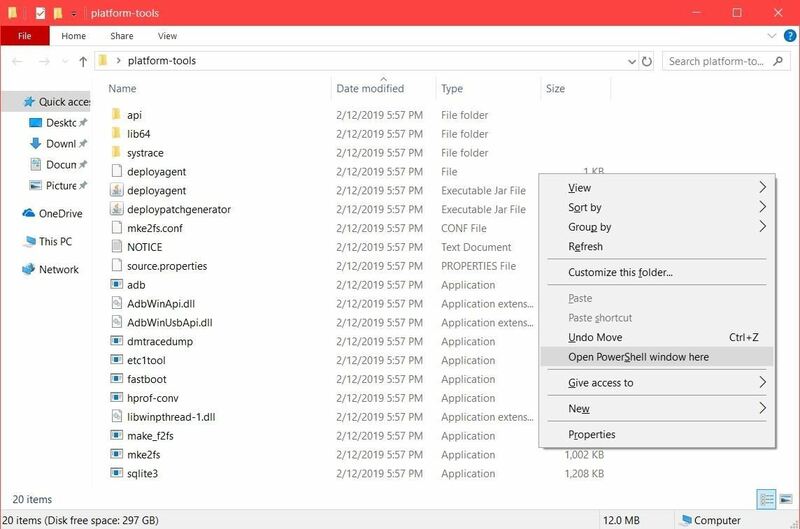 Open the platform-tools folder itself, then copy its location of it from the address bar at the top of the window. 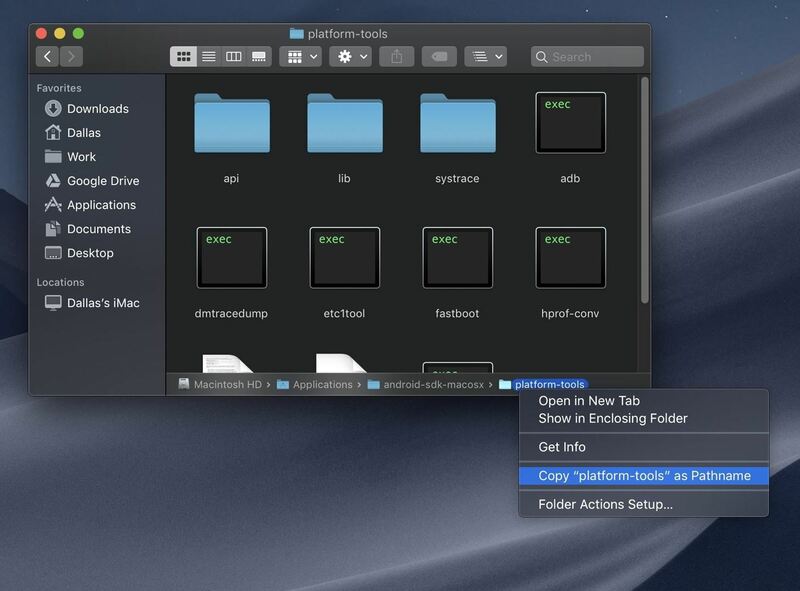 If you're having trouble copying the folder location on macOS Mojave, open the platform-tools folder in Finder, then press cmd+opt+P to toggle the path bar overlay. From there, right-click the "platform-tools" section at the bottom of the window and choose "Copy as Pathname." Now you'll need to locate the command line prompt or terminal application for your operating system. On Windows, bring up the Start menu (Windows key), do a quick search for "cmd," then hit enter to open the command prompt. For Linux and Mac systems, you want to open up the "Terminal" program located in the Applications folder. Now that your command line or terminal application is running, you'll want to redirect it so that it points to your platform-tools folder. Start out by typing "cd" (without the quotes) followed by a space, then paste the path location you copied from the platform-tools folder. After you paste the copied location, hit enter to forward the terminal to the correct directory so you can begin using ADB and Fastboot commands for the first time. You're all set! Alternatively, if you're using a Windows machine, there's an easier method if you prefer to keep it as simple as possible. 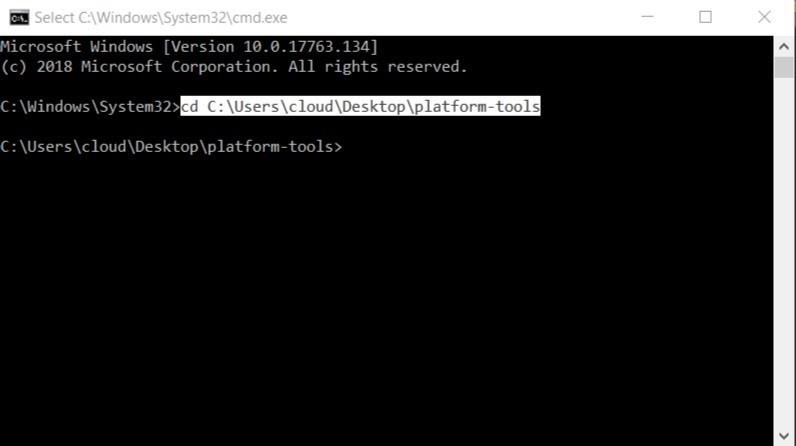 Rather than opening the command window and manually pasting in the location of your platform-tools folder, you can save an extra step with this next tip. Open your platform-tools folder, hold the Shift key on your keyboard, then right-click any blank space of the folder to bring up a menu. If you're on Windows 10 or 8, you should see an option called "Open PowerShell window here." But if you're running Windows 7, it'll say "Open command window here." Select the option that corresponds with the version of Windows you have and then the command line window will launch. You should notice the path of the command window already points to the platform-tools folder — done! This method works with any folder you wish to run commands through, so it's especially useful to know.